My kids found this picture of me, taken when I was 18.
and this particular day it happened to fix just perfectly :) Julia Roberts had nothing on me hahaha! 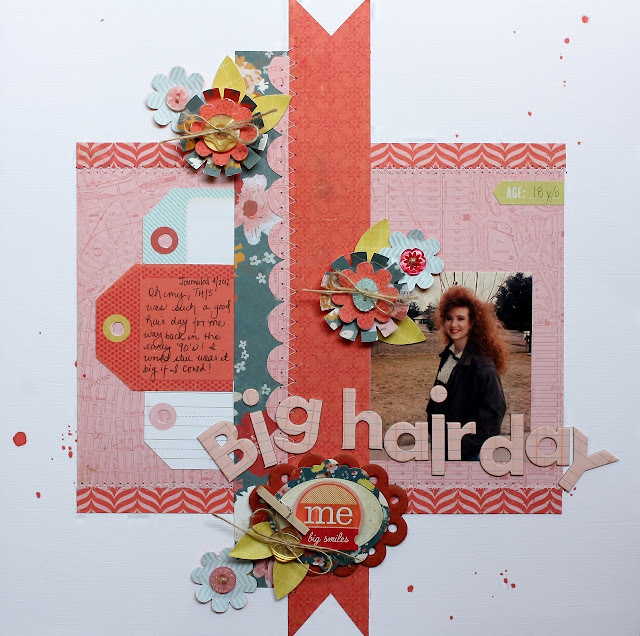 The challenge is entitled "The Red Carpet"
and the only instructions are to use shades of red on a layout or card. I used the April Nook Kit featuring STORYTELLER by Crate Paper. I Top Punch from Imaginisce and the Trio flower punch from EK Success. You still have plenty of time to come over and play along with us! Tomorrow I'm up at Imaginisce for our Canvas Corp. Blog Hop. I have some really fun stuff to share with you. Also tomorrow is the Monday EAD Blog Hop. Lots to do...lots to see! LOL I so remember those days!! !